in a large bowl mix the water and yeast together and let sit for about five minutes until the yeast is dissolved. add the flour, salt, mint, oregano and olive oil and then bring together with a rubber spatula and then get your hands in and begin to knead into a ball. Once you’ve got all the flour off the inside of the bowl and the dough has begun to smooth out slightly, flour your work surface and place the dough onto it. Oil the inside of the bowl and set aside. knead the dough for about 5-7 minutes, until the dough is smooth and elastic. You shouldn’t need to use too much flour whilst kneading but if the dough is sticking then use flour sparingly. place the dough in the oiled bowl, cover with cling film and let it rise until it’s doubled in size, about 1 hour. turn the dough out onto a lightly oiled work surface. 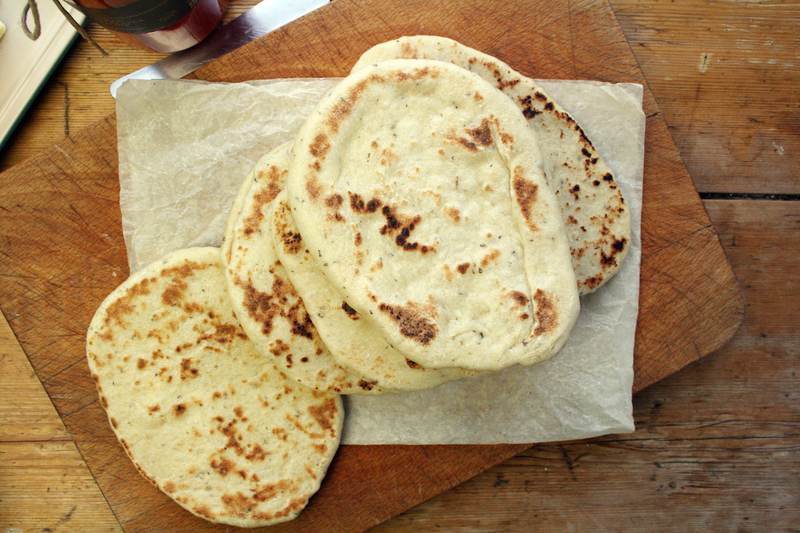 Divide the dough into 8 equal pieces and gently flatten each piece into a thick disk. Using an oiled rolling pin, roll one of the pieces into. It will pull back due to the elastic nature of the dough but if you lift and turn the dough frequently as you roll it should begin the stay in shape… I actually pulled it out quite a bit before throwing into the pan… repeat with the other pieces of dough. 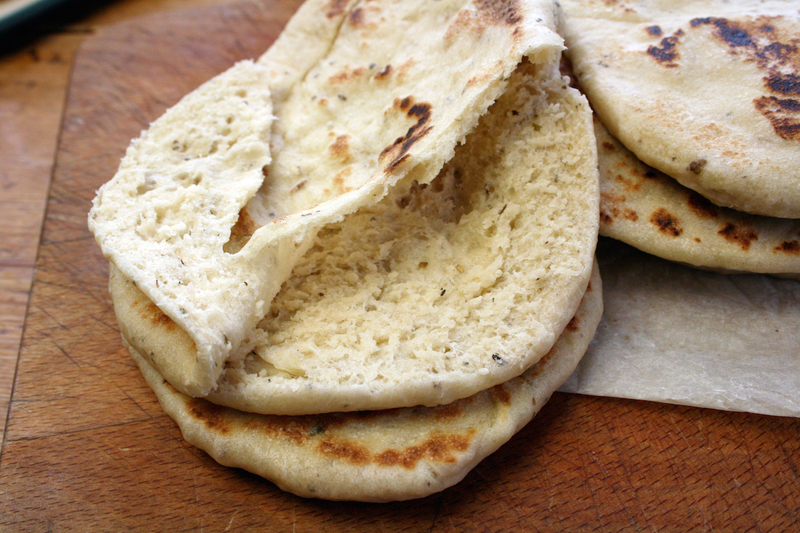 warm a frying pan over medium-high heat – you won’t need to add any oil because you’ve used oil to roll out the pita but ensure the pan is very warm although not smoking hot. 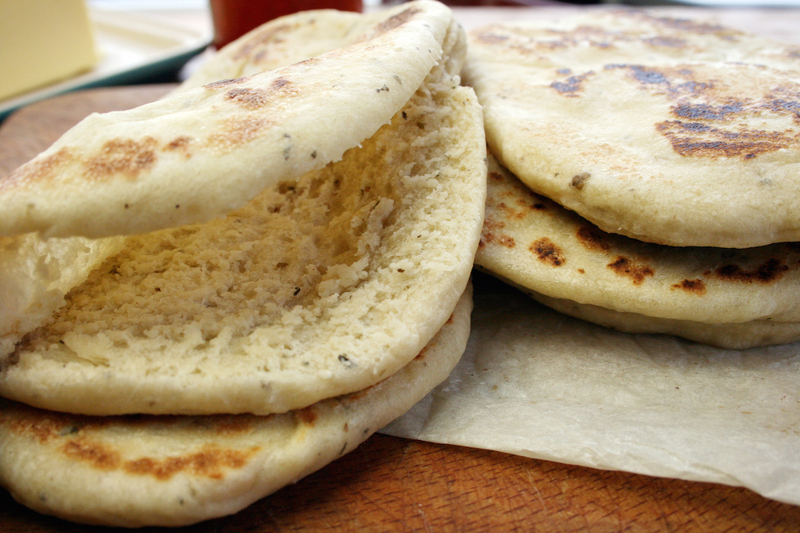 Throw in a rolled-out pita and bake for 30 seconds, until you see bubbles starting to form. Flip and cook for 1-2 minutes on the other side, until large toasted spots appear on the underside. Flip again and cook another minute to toast the other side. 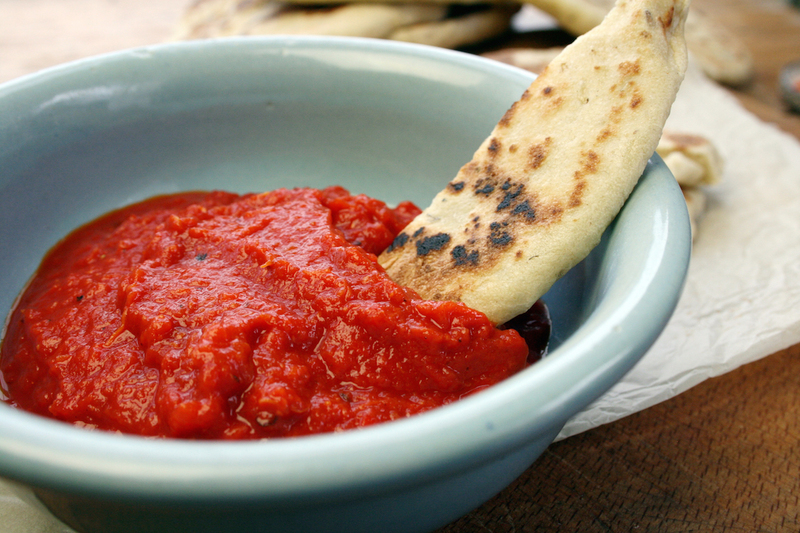 Set aside until all your pita’s are cooked. They were of course delicious eaten straight away but I preferred them toasted in a toaster, split or sliced and slathered with butter. They look like perfect specimens, Dom. Now can we have a recipe for Falafel please? Thanks Mark. I've never made falafel. I'll have to do some research!! Well. What is there really that we have to talk about but the weather? Thanks honey. The dried mint is not what is usually use but it's worked perfectly. Ooh wonderful stuff Dom. I've made pitta a couple of times now and they were great, but I'm rather regretting not adding mint and oregano now. I want the sun and blue skies, but really feel I need a bit of proper winter first – with sun and blue skies!